udor is an internationally published fashion photographer and artist. As a veteran runway photographer of New York Fashion Week, he had been invited several times as a guest on The American Fashion Podcast (Huffington Post just named AFP one of the five most important podcasts about the fashion industry in the US), discussing the fashion industry, top designers and what and what not to do on the runway (see the "press" section). As a photojournalist he has worked with and photographed various celebrities ranging from Randy Jones, the original cowboy of the Village People, actor John Turturro, actor and director Mario Van Peebles, the former president of Poland and Nobel Peace Prize Laureate Lech Walesa, actors Danny Glover, Gina Lollobrigida, Yoko Ono as well as Beverly Johnson and many more. His photography has been published in Marie Claire, Ecouterre (London and Paris), Style Blazer, Huffington Post, Daily News, New York Post, Fashion Syndicate Press, Moda Cycle NY and Germany, Black Tie International, Jet Magazine and many more. 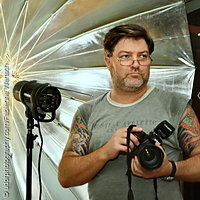 udor has been a contributing photographer to BTE TV for over a decade, covering the runways of New York Fashion Week and various celebrities in film and fashion for Fashion Avenue News Magazine. He is also the creative director and photographer for "New York Girl Style Magazine" with recent editorials about the NY fashion designer Shoshanna and the Chic City series with clothing provided by Andrew Marc. udor was born in Germany in the middle of the roaring sixties in the bohemian part of Munich, called Schwabing. His father, a journalist and sound-engineer was a veteran of German film and television production, working for the largest German television network "Zweites Deutsches Fernsehen" (ZDF). udor began photography at age 11 or 12 with an old viewfinder camera of his fathers, his love for photography was already evident when he did an internship at the photolab of ZDF's media office at age 15, where he continued to work part time for the following two years. Press photographers recognized his talent and urged him to study photography and make it his living. Since those early critiques and recommendations started… they never ended. At the age of 21, he already documented the 1986 World Fair in Vancouver, Canada for 'Ute Emmerich Fotoarchive", a German stockphoto agency. Aside from photography, as a visual artist, he is also a surrealist painter.